You’ve seen this film before. It’s existed ever since the inspirational sports genre first became a thing: the film where an underappreciated underdog (or underdogs, if it’s a team sport) defies everyone’s expectations to compete in a sport they love doing, supported by a troubled and unconventional coach who trains him through a musical montage, facing opposition from rival teams, and overcoming all negative comebacks to make that final attempt that not only wins the game but also the respect of the crowds and all the naysayers. It’s The Mighty Ducks, it’s Rudy, it’s The Bad News Bears, it’s Cool Runnings, it’s pretty much every single sports movie you’ve seen over the past few decades, and now it’s Eddie The Eagle, which takes that time-old template and applies it to the true-life story of Michael “Eddie” Edwards and his pursuits of succeeding in Olympic ski jumping. 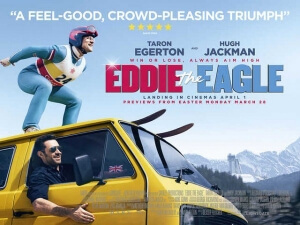 But like most films that rely heavily on clichés and genre conventions, it’s the execution that really makes a difference, and while Eddie The Eagle is far from the best of its kind it’s still a harmless crowd-pleaser that does not feel ashamed to be taking on such an exhausted template. Eddie is, naturally, our underdog; played by Kingsman’s Taron Egerton, the hapless short-sighted young man decides to practise his lifelong obsession with competing in the Olympics by taking up the dangerous sport of ski jumping, travelling to a resort in Germany in order to start training. However, when that starts to turn into a parade of falls and injuries, along comes our troubled and unconventional coach for the evening: Hugh Jackman’s Bronson Peary, a (fictional) former American athlete who has turned to alcoholism after a failed career, who eventually comes round to supporting Eddie in his endeavours, and helping him fend off smug insults from pessimists that include Norwegian skiiers and even Tim McInnerny’s snobby Olympic committee member. Just by reading that, you can determine very quickly exactly where it’s all going to go in the end because, once again, this kind of film has been seen many times before in so many ways. However, director Dexter Fletcher has clearly taken a cue from his previous directorial effort Sunshine on Leith and staged things so that everything has an uplifting quality to it that puts a smile on even the most stone-hearted audience member. Yes, there is almost nothing new about the story, and anyone who’s sick and tired of seeing films like this will most definitely want to move along, but because Fletcher’s direction is clearly aiming for something that makes the general public want to cheer and generally have a good time, it’s admirable to see a filmmaker make something that rejects cynicism and just has a bit of fun with things we know we’ve seen so many times before. As cheesy as some of the set-pieces can be, you still find yourself on the edge of your seat against your better judgement – something that only an audience-friendly director can accomplish. It also helps that Fletcher has cast two enjoyable actors in the lead parts to help us root for them even more, even when they’re going through trials and tribulations we are all but certain they will make it out of in the end. Jackman is clearly having fun in a reasonably unchallenging stock role – and at least it’s better than the embarrassment he displayed in last year’s Pan – while Egerton, fast becoming a household name after turns in Kingsman, Testament of Youth and the forthcoming Robin Hood: Origins movie where he’s set to play the titular role, is on effortlessly lovable mode here as a warm and sympathetic character that’s easy to get behind, if just because Egerton plays him with such heart and enthusiasm. There is definitely passion involved in making a film like this, and Fletcher seems to realise that while he can’t necessarily rewrite the formula that’s worked for so many years, he might as well embrace them; as a result, Eddie The Eagle is an amiable and light-hearted film despite its obvious set-backs, one that will put off those wanting something new in their sports movies but fill everyone else with a sweet sense of enjoyment. Eddie The Eagle takes the template that has been used and abused in countless sports movies over the past few decades and doesn’t do much with it that’s new, but the crowd-pleasing direction by Dexter Fletcher as well as the two enjoyable and sharp lead actors make it a fun, light-hearted romp that audiences will no doubt soak up.